Nice ray-tracing, but what about real games? Larrabee is announced: but is trouble already brewing for the co-processor? 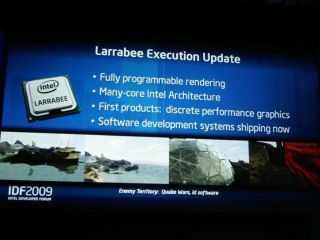 Intel treated the world to the first ever public demonstration today of the mythical Larrabee co-processor. Sadly, however, Intel failed to disclose any details whatsoever about the much anticipated graphics-optimised multi-core chip. , the more pressing question is whether it will be any good for conventional raster-based graphics. Raster graphics, of course, is the method used by existing GPUs from AMD and NVIDIA and that's not expected to change for several years to come. Moreover, in the weeks leading up to this year's Intel Developer Forum, the online rumour mill has been awash with tales of trouble regarding Larrabee. For starters, it's said to be running at least six months late thanks to bugs afflicting early spins of the chip. Making matters worse, it's thought Intel is having problems getting conventional DirectX graphics running quickly through Larrabee's revolutionary programmable graphics pipelines. The best way to scupper such negative rumblings would have been a solid demo of Larrabee running a current game. Anyway, following the presentation Intel bigwig Sean Maloney was distinctly prickly when pressed for further details. In the end, he disclosed nothing new at all. But never mind, because we can tell you what Larrabee will look like. Namely, it will be a two billion transistor 45nm chip with 32 in-order cores. About the same size as AMD's new high GPU, the Radeon HD 5870, then. Intriguing stuff, but nothing we saw today nor the raw specs of the chip get us any closer to knowing just how competitive it will be compared to incumbent GPUs from Nvidia and AMD.